Born enraged, Screamin' Meemie is always shattering the far end of the anger spectrum. Only his sweet poetry can (kind of) help when he's upset. 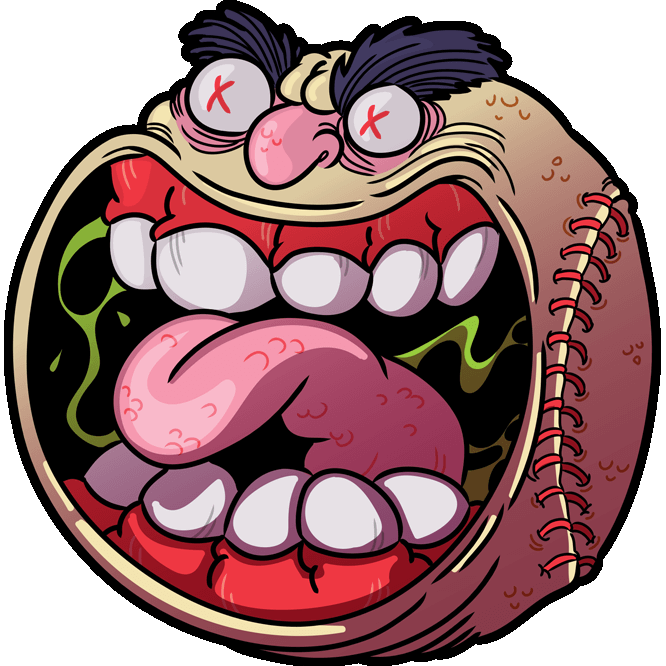 Of all the characters in the line, Screamin' Meemie may be the perfect distillation of what a Madball should be: he's not just some random thing that happens to be shaped like a sphere (cf. Hornhead), he's an actual ball that's got a face and a personality. 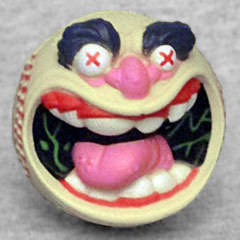 He wasn't alone in that, back in the day - there were also the "Super Madballs" (Touchdown Terror, Foul Shot, and Goal Eater), but the actual sport-themed Madballs didn't catch on as much as the random weirdos. As always, Screamin' Meemie is a baseball with its tongue hanging out. The modern Madball artstyle is softer and rounder than the previous efforts, so his mouth is open wide, and the teeth we see don't have flat edges. He's got a bulbous pink nose and bright white eyes that contrast against the ecru... skin? Surface? Whatever you want to call it. His pupils are red X's, which is a weird choice: it makes him look dead. He has big, bushy eyebrows, and thin blue lines in his mouth that are probably supposed to be spittle, but it ends up looking like he's screaming lightning bolts. The red stitches on the back don't actually have the layout of a real baseball, and there's some pink goo (brains?) leaking out where a few of the stitches have popped. Series 2 of the blind bags featured "Mix-Ups," re-releases from Series 1 with new colorschemes.  Screamin' Meemie's new color sees him as a pale blue, which doesn't make any sense: who's ever heard of a pale blue baseball?